9 April 2019 - Farewell party for postdoc Riccardo: one and a half years of exciting science just flew by. The HemmerLab wishes you all the best for your Marie-Curie Postdoctoral Fellowship at the University of Madrid! 3 April 2019 - Farewell party for our visitor Isabel: it was great having you visiting the lab! Wishing you all the best! 18 March 2019 - Congratulations to our Master's student Nan for having her paper on NaGdF4-based MRI contrast agents accepted for publication in Nanoscale. 05 March 2019 - Excited to see the first outcome of our Canada-Sweden collaboration: our just accepted paper by Riccardo, Fadi et al! 19 February 2019 - The HemmerLab welcomes Dr. Nicholas Obitte, visiting postdoc from the University of Nigeria, Nsukka! 01 February 2019 - The HemmerLab welcomes Dr. Isabel Gessner, visiting postdoc from the University of Cologne, Germany! ​11 January 2019 - When lanthanide-based materials meet lanthanide-based molecules, this is the outcome: our just accepted paper by Riccardo, Ilias et al! January 2019 - Happy New Year to everyone! And a warm Welcome to our new Honours Students Itzel and Nathaniel! 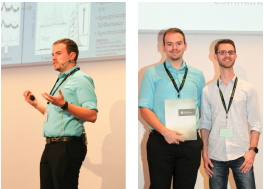 Inorganic Discussion Weekend 2019 - Congrats to Nikita for winning the 3rd place for his oral presentation on "Microwave-Assisted Solvothermal Synthesis of Upconverting and Downshifting Rare-Earth Doped LiYF4 Microparticles"
November 2018 - Welcome to our UROP student Yifei! October 2018 - The HemmerLab welcomes visiting student Camille from ENCPB, Paris! September 2018 - Welcome back to school! A special Welcome to our new Honours Student Emma and Welcome Back to Faduma who just starting her Honours Project and Fadi who joined the team of Master Students! 1 May 2018 - Welcome to our newest group members, RISE summer student Steven and summer volunteer Faduma! April 2018 - Nikita Panov was awarded an Ontario Graduate Scholarship 2018-2019. Congratulations, Nikita! March 2018 - Dr. Ute Resch-Genger (Federal Institute for Materials Research & Testing, Berlin, Germany) and Dr. Hemmer were awarded the uOttawa Visiting Research Program - the group is looking forward to host Dr. Resch-Genger in Fall 2018! 1 November 2017 - The group is welcoming our new postdoc Riccardo Marin! September 2017 - The group is growing. Welcome to graduate students Ilias, Nan and Nikita! May 2017 - Volunteer Joelle Machaalani joined the lab. Welcome, Joelle! April 2017 - Yacine Mazouzi from Université Pierre et Marie Curie (Paris, France) joined the lab for the next five months. Welcome, Yacine! ​November 2016 - Congratulations to Jamal Al-Refaee, Nathaniel Leslie, Brad Martire and Qing Qing Zhao for their UROP Awards. October 2016 - Volunteering student Fadi Oussta joined the team. Welcome to the lab! October 2016 - Congratulations to Alex Therien! 2nd Prize for the presentation of "My Project in 180 Seconds" at the 28e Colloque de Chimie de l'Université de Sherbrooke! ​September 2016 - Volunteering student Qing Qing Zhao and Honours student Jeffry Colin joined the team. Welcome to the lab! May 2016 - Volunteering students Nathaniel Leslie and Fozia Nur joined the team. Welcome to the lab! May 2016 - COOP summer students Rayan Ghadieh and Alexander Therien will join the team. Welcome to the lab! 15 March 2016 - The Hemmer Research Lab was awarded CFI funding. See press release for more details. 12 March 2016 - The website goes online! 10 March 2016 - The Discover Microwave Reactor has arrived! The lab starts to get set-up.